Every atheist I have met in Arizona was either Mormon or Seven Day Adventist before they became atheists. Thanks Strom. Yeah, I am interested. I find the whackiness of Mormon beliefs intriguing, plus I really feel for the people brought up in this system. They seem to have brainwashing down to a science. Congrats on getting out. It helps now that there is a huge support system for exmos that didn't exist when I left. I was pretty much on my own. The other part is I have a fundie family that dates back to the earliest days (my last name is Young) so expectations in that respect were shattered, so to speak, which alienated my siblings. I believe in following my commitments, but having neighbors you've known for years suddenly not speaking to you is tough; not for me, but for the family. Nobody cares about the grooming standards of someone who believes their underwear will help them become a literal god. You can end a conversation with Mormons very quickly by saying that anyone who isn't smart enough to figure out Joseph Smith was a womanizing con man isn't smart enough to talk to you. You can drop the second 'm' from 'Mormon' and lose no semantic content. 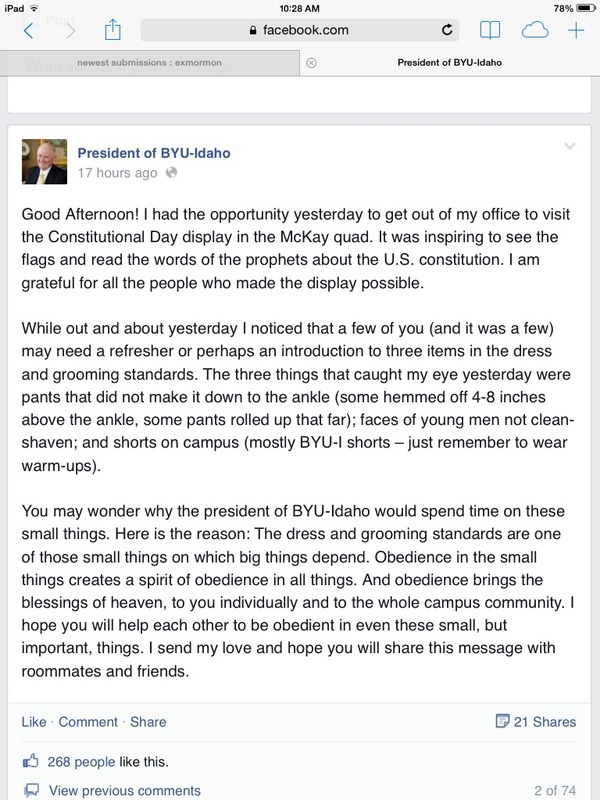 "Obedience", we can't have people running around in shorts now can we? Wearing shorts leads to long hair, long hair leads to rock n roll, rock n roll leads to pot, pot leads to acid, acid leads to pretty bunny rabbits dressed in neon stockings running accross the front lawn, and all of this will lead to the one thing we are most profoundlt afraid of..........questioning your religion. Once again, this is true.